The 2018 supply chain conference season kicked off for me last week. I gave a keynote presentation on emerging technologies (drones, driverless trucks, 3D printing, blockchain, etc.) at the SMC3 Jump Start 2018 conference in Atlanta, GA. Unlike most industry conferences, which are crammed like sardines into the month of May, this one is always in January and it spotlights the trends and topics that are top of mind for supply chain and logistics executives heading into the new year. On the first day, economist Dr. Don Ratajczak from Georgia State University and Benjamin Hartford, Sr. Research Analyst at Baird, gave a comprehensive of overview of global economic trends. 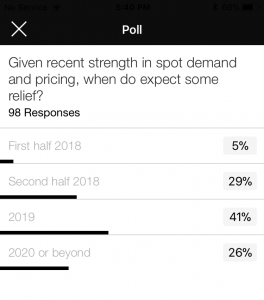 They presented too much data and information to summarize here, but the main takeaway was that most indicators point to stronger economic growth in the year ahead and virtually everyone in the audience raised their hands when asked if they felt optimistic about the economy and business growth opportunities. This aligns with what the conference attendees are feeling and expecting. 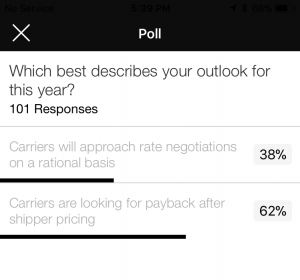 In polls conducted via the conference mobile app, 62 percent of the respondents believe that “carriers will be looking for payback” in terms of pricing this year, and 67 percent don’t expect any relief until at least 2019 (with 26 percent saying relief won’t come until 2020 or beyond). Emerging Technologies: What’s Real, What’s Hype? When it comes to drones, driverless trucks, blockchain, and other emerging technologies, what’s real and what’s hype? That’s the most common question I get from supply chain professionals today and it’s the main question I addressed in my keynote presentation. Jeff Berman from Logistics Management wrote a nice article summarizing my talk, so I encourage you to read his writeup. 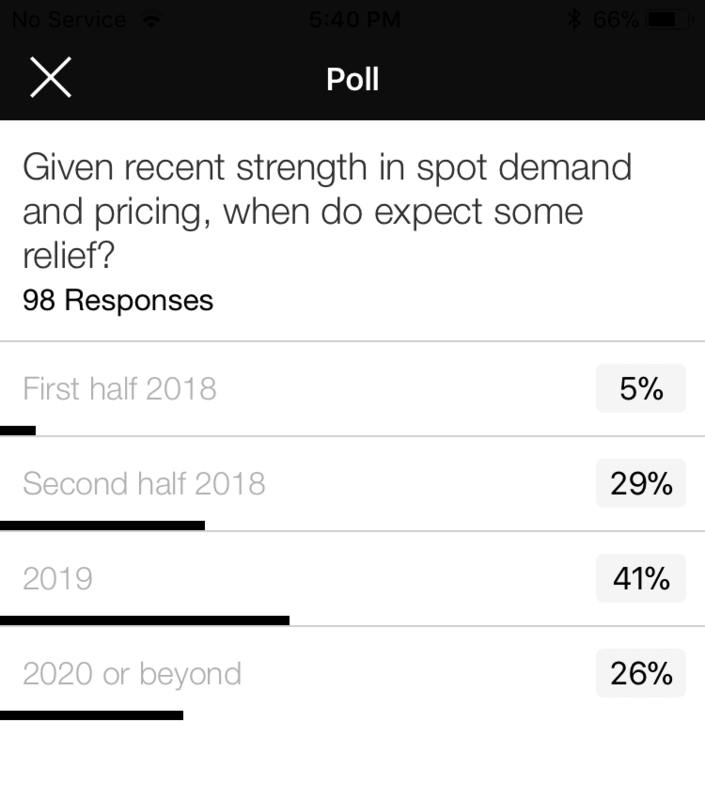 At the end of my talk, I polled the audience and asked them which emerging trends (of the ones I presented) will deliver the most supply chain and logistics benefits in 5 years. 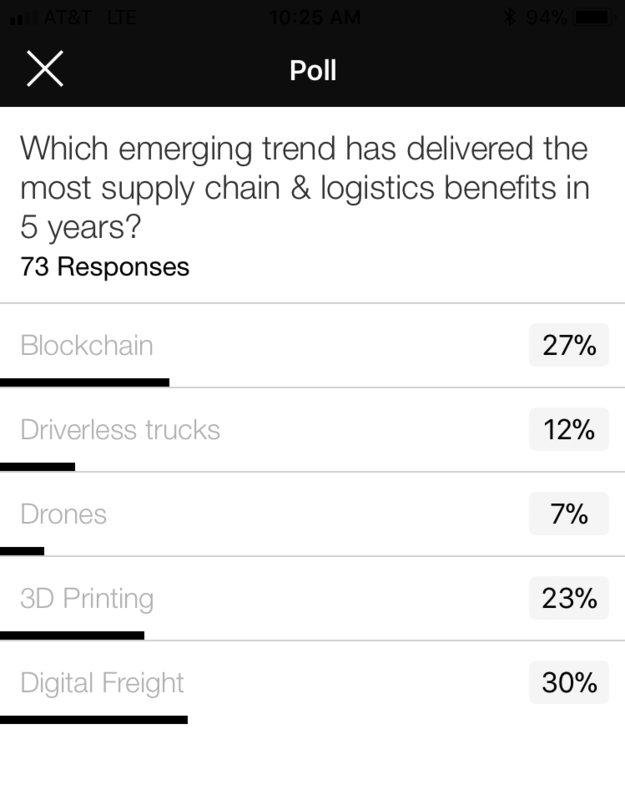 Digital freight and blockchain topped the list, while driverless trucks and drones were at the bottom. I was a bit surprised that digital freight topped the list, but considering the makeup of the audience (more logistics service providers than shippers), I guess it’s not so surprising. There’s certainly been a lot of buzz and investment in this space over the past few years, with Flexport, Uber Freight, Trucker Path, Freightos and others looking to disrupt the traditional freight forwarding and brokerage markets. 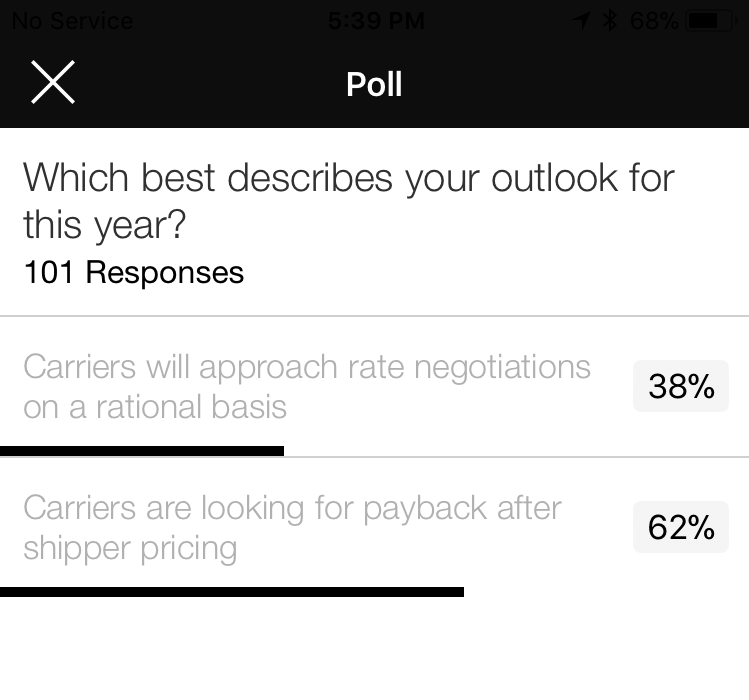 As I’ve said before, it takes a lot more than a mobile app to succeed in the freight transportation industry. The long-term success of these startups will ultimately depend on whether shippers and carriers take them seriously, and whether they provide a better value proposition than the status quo. At a minimum, however, these digital freight startups are putting the incumbents on notice that remaining complacent is not an option, especially when it comes to investing in technology. Looking at dots on a map is interesting, but the real value is knowing what to do with that real-time information and taking action. If EDI is the most advanced technology you have for visibility, you are getting left behind quickly. Expectations are changing in the business world; we want the same level of visibility, service, and ease-of-use technology as in the consumer realm. Trust between shippers, carriers, and consignees — as in how the data will be used — is a critical factor for success. Cyber attacks are a growing risk and reality in supply chain management (see The Day a Cyber Attack Brings the World’s Supply Chains to a Halt and The WannaCry Cyberattack: Another Warning for Supply Chain Executives). Mark Solomon from DC Velocity moderated a panel discussion on this topic with Andrew Valentine (Associate Managing Director, Cyber Security and Investigations at Kroll), Jay Harmon (Information Security Consultant at Borderhawk), and Scott Marticke (Senior Consultant at Breakaway Consulting). When it comes to cyber security, companies put too much emphasis on technology and not enough on people and processes. The latter two are often the weakest links. The average time between when a hacker breaks into your systems and you discover it is 270 days! At many companies, there’s a disconnect between the security policies in place and what’s actually being done. In other words, if people would just comply with the policies already in place (and if companies would enforce those existing policies), you would greatly minimize the risk and/or impact of a security breach. I also moderated a panel discussion highlighting the transportation management system (TMS) evaluation and selection process undertaken by Moen, the number one faucet brand in North America. Michael Leaser (Director Global Logistics & Transportation at Moen) and Alan Loos (Sr. Manager, Order Fulfillment Systems at Moen) were joined on the panel by Geoff Milsom (Sr. Director at enVista) and Monica Wooden (CEO of MercuryGate). One of the key points made by Leaser and Loos was that you have to invest the time and effort upfront to truly understand and define your requirements and objectives and to adequately evaluate potential technology partners. If you short circuit this process — such as relying solely on a Gartner report to pick your vendor — you could end up with costly problems down the road. In Moen’s case, the company worked with enVista to help it develop the business case and manage the evaluation and selection process. Eight TMS vendors were included in the evaluation process, including MercuryGate and SAP (Moen’s ERP provider), which were the two finalists. Moen ultimately selected MercuryGate, in part because of MercuryGate’s existing carrier network and the ease of integrating with them. When defining your TMS requirements and objectives, you have to think beyond the short term; you have to take your long-term requirements and objectives into consideration too. Therefore, you have to have confidence that the technology partner you select will be there for you in the long run. Related to the point above, this is about selecting a technology partner, not a vendor. You’re selecting a company and team that you want to establish a long-term relationship with, a company and team that align with your culture and objectives. Moen created a very comprehensive RFI/RFP (over 900 requirements), but the real value didn’t come from checking off boxes, but by having back-and-forth conversations with the TMS providers. Moen learned a lot through these conversations and so did the TMS providers. Yes, it was a bit time consuming, but the investment led Moen and MercuryGate to develop a deeper understanding of each other, which is important as they move into the implementation phase. Overall, Jump Start 2018 was a great learning and networking event, and a great way to jump start the conversations around the trends and topics that will impact supply chain and logistics in the year ahead.